Berat in Albania is called "the town of a thousand windows". And that is so true. Looking at the beautiful houses "climbing" up the steep hill around the old town, you can't help but notice the seemingly endless number windows. Because Berat is luckily situated in the mountains, the hill also offers amazing bird's eye views. 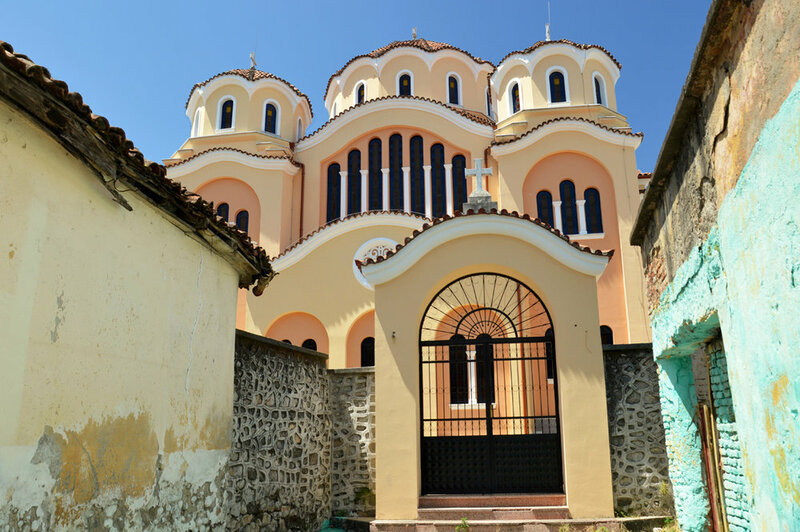 Both Berat and Gjirokaster (take a look at my post about Gjirokaster) are similar and the most beautiful towns in Albania but they differ slightly in style from each other. Together with Mostar, Prizren and Ohrid, they form a district full of the distinctive Ottoman Empire architecture, unique for Europe. This region, although as rich in history and as attractive as the Spanish or Italian equivalents, receives hardly ever foreign tourists. But this is a good thing, you can explore what's best without annoying crowds and discover Europe's best hidden gem freely. Berat lies a bit off road from the main Albania's attractions - the riviera and the Alps. It is more or less halfway between Gjirokaster and the capital - Tirana. A drive from each of them to Berat would take around 3 hours - the roads in the country are not too good comparing to the roads near the coast so more time is needed. Nevertheless, Berat is an amazing town, unique on a European scale and well worth a visit. If it was in Western Europe, it would be no less popular than some famous towns along the French Riviera. Berat is divided into two parts - the old town and the new city. They are nicely separated and the beautiful Ottoman architecture, fortunately, is not mixed with the communist concrete blocks. Of course, all of the places to worth visiting in Bereat are in or around the old town. But Berat should be admired as a whole - as one big attraction. Berat has two "levels" - one at the bottom of the valley and another one on top of the adjacent hill. Both are unique and you can enjoy amazing views from both elevations. Another amazing thing about Berat is food - the quality is amazing and prices even better! You can have a great meal in a lovely restaurant located in the old town for a quarter of the price you would have to pay in Italy or Spain. The Old Town - the UNESCO part of the city - here you can enjoy the typical sights of a medieval town - get lost in the tiny streets, have a meal on one of the amazing restaurants and cafes and take pleasure in absorbing the overall cozy atmosphere without too many crowds of foreign tourists. The old town gets extremely beautiful after dark with the illuminated houses and the Gorica stone bridge over the river Osum which flows through the amazing Osum Canyon (Berat is a perfect base for the rafting trips to the Osum Canyon). From the bridge, you'll get the best panorama of the houses stacked tightly one on top of another. What's unique about Berat is the architecture - you would expect such a town in Turkey - not necessarily in Europe - few places in the heart of Europe can boast such an original touch. The houses are virtually built into the stone facade and their walls are painted white which contrast with the reddish-brown roof tiles. Not to mention the hundreds of windows. The pedestrian street just at the bottom of the hill by the bridge has also some amazing examples of how the modern architecture is perfectly incorporated into the old style. Don't be surprised to see the US flags everywhere in in Berat - Albanians seem to adore the Unites States. All this is the reason why I love the Balkans - such short distances and so many surprising things to discover! Kala Castle - Medieval fortress build on top of the steep hill - the best spot to admire the bird's eye view of the valley and the town below. There is a steep but very satisfying climb to get to the top. When you reach the castle, you'll discover that there's another mini old town there - however, unfortunately, some of the impressive buildings are abandoned and badly damaged. If you like museums, you'll be interested in visiting the National Iconographic Museum. This upper part is totally worth it - don't miss it! Near the fortress, you can also spot the Holy Trinity Church overlooking the hills. Not far from Berat, around 60 km (47 miles), you can find one of the most beautiful yet completely unknown canyons in Europe - Osum Canyon. Berat is a perfect base for trips to the canyon. During the spring, when the river Osum has the strongest current, rafting becomes a very popular activity. We tried it and it was an amazing experience! Don't miss Osum Canyon when you're visiting Berat - even when you're there in the summer and the river is almost dry - it's worth it just for its beauty. For more information, see the Related Posts below.